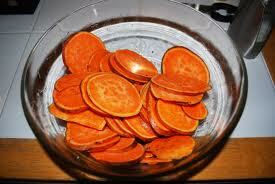 Slice sweet potatoes (from your local farmers market, of course) into discs and put on thin baking pan or pizza pan. I put them on foil to avoid cleaning the pan, but I’m efficient like that. Sometimes I slice one tater, sometimes four if I’m feeling frisky. BUT MY FAVORITE WAY TO PREPARE THESES LIL’ SLICES OF YUM is to sprinkle a little cheese atop each one (I’ve use goat, blue, park and cheddar—parm and blue probably work the best) OR sprinkle only Turmeric. Try them each way and find your fave. 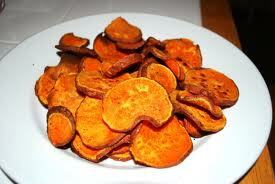 You can actually leave them in for much longer—I often forget about them, and later find them in my oven. NOTE: try to slice each disc with similar thickness, if you have some discs thin and others thick, the thicks will be hard and the thins will get burned. And nobody likes to get burned. What type of herb options would you reccomend for dressing these up? Rosemary maybe?